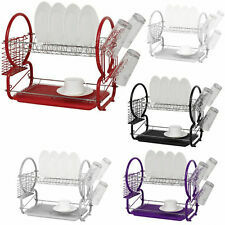 2 Tier Plates Dish Cutlery Cup Drainer Rack. Good clean condition. DISHWASHING UP BOWL WITH DRAIN PLUG. EXCELLENT FOR KITCHEN SINK / CARAVN CAMP KITCHEN. 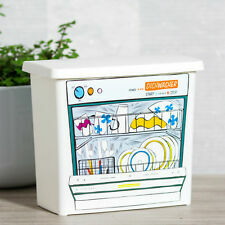 Type: Dish Drainer. 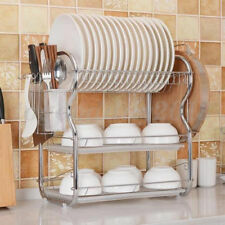 1 x Dish Drainer. 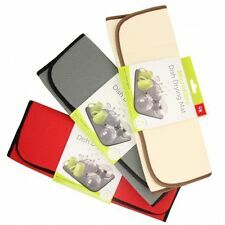 Easy to clean, Fold flat for easy storage, fits in a cutlery drawer perfectly. Made from high quality Iron material, durable and rustproof. Material: Iron. Can holds larger plates and bowls, practical and portable. Plastic tray equipped to hold drip easily. 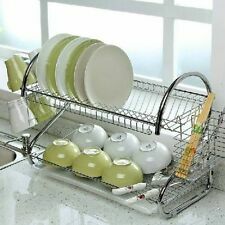 2 TIER CHROME PLATE DISH CUTLERY CUP DRAINER RACK DRIP TRAY PLATES HOLDER. Square Plastic Washing Up Bowl Square plastic washing up bowl in Glitter Red Ideal way to protect your sink from stains, odour and residue caused by washing dishes and peeling vegetables Easy clean finish Features a curved lipped rim with reinforced carry handles Colour coordinated to match other housewares products Size: 30 cm Length x 30 cm Width x 15 cm Height Made in UK If there is any breakages in your parcel, to ensure a replacement/partial refund, we will need photographic evidence of the broken item and the inside/outside packaging. If we don’t get this we cannot send out any replacements or offer any partial refunds. DISH WASHING UP BOWL WITH DRAIN PLUG. EXCELLENT FOR KITCHEN SINK / CARAVAN CAMP KITCHEN. Perfect for kitchen sink,etc. Material: Plastic. Square Plastic Washing Up Bowl Square plastic washing up bowl in Graphite Ideal way to protect your sink from stains, odour and residue caused by washing dishes and peeling vegetables Easy clean finish Features a curved lipped rim with reinforced carry handles Colour coordinated to match other housewares products Size: 30 cm Length x 30 cm Width x 15 cm Height Made in UK ---If there is any breakages in your parcel, to ensure a replacement/partial refund, we will need photographic evidence of the broken item and the inside/outside packaging. If we don’t get this we cannot send out any replacements or offer any partial refunds. Handy crockery holder and cutlery divider. 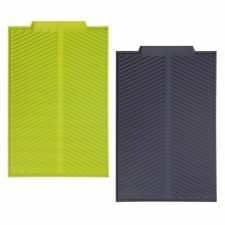 Foldable for easy storage. Compact enough to fit under the sink, in the car boot or cupboard. We will then advise you on resolving this issue, through repair where necessary. 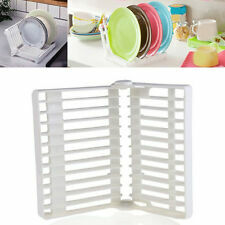 46cm Large Plastic Dish Rack. Black Plastic Finish.